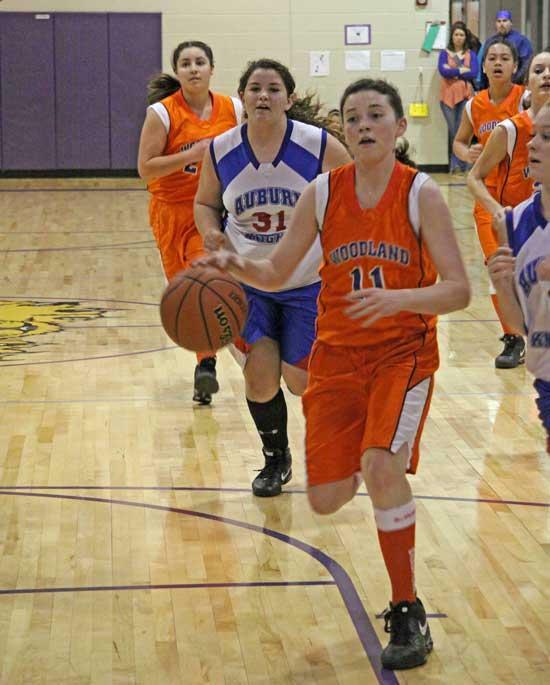 Hannah Faulkner, 11, beats the defense on her way to a layup during the 2011 Cannon County Elementary Tournament Championship. A vibrant and supportive standing-room only crowd witnessed history when Auburn captured both the girls and boys championships of the 2011 Cannon County Elementary Tournament at Woodbury Grammar School Saturday night. It marked the first time Auburn won both championships in the same season. The Lady Knights continued their perfect dream season with a 37-28 win against a fiesty Woodland team in the girls championship game to improve to 19-0. Auburn's boys completed the sweep with a 40-35 triumph against No. 1 seed Woodland to improve to 17-2. For good measure, Auburn's cheerleaders earned the 2011 Spirit Award, and why not? Auburn fans who filled the gym had plenty to cheer about and the cheerleaders kept them on their feet most of the two title games. The girls championship game was a familiar site with Auburn and Woodland squaring off for the fourth consecutive year. The teams split those meetings following Auburn's win in 2011. Interestingly, it marked the seventh consecutive appearance in the girls championship game for Woodland coach Suzzette Sissom with the first three coming at West Side. Tournament MVP Erin McReynolds led Auburn with 13 points and All-Tournament selection Cheyenne Fann added 10, including six crucial points in the pivotal fourth quarter. Paige Tenpenny and Kristen McReynolds, also All-Tournament selections, added eight and six points, respectively, for the Lady Knights. Ariana Kaliponi led Woodland with 12 points and Cydney McPeak added eight. Hannah Faulkner tallied three points and added a team-high five rebounds. All three players were named to the All-Tournament team. It marked Auburn's fifth win against Woodland this season, including three in tournament championship games. Auburn's boys wasted little time establishing themselves as the team to beat in their title game. The Knights stormed to a 14-0 first-quarter lead and stretched it to as much as 20-0 before taking a 24-7 advantage into the half. Woodland made a second-half run and got as close as five but could never get closer. One big reason was the play of guard Briar Jakes, who poured in a game-high 15 points on the strength of four 3-pointers. His back-breaking 3-pointer midway through the fourth quarter after Woodland had closed to within seven was a crushing blow. Jakes, Garrett McReynolds and Marshall McReynolds were All-Tournament for Auburn, and Reagan Scott was named Tournament MVP. Jackson Mason led Woodland with 12 points and 11 rebounds. He made the All-Tournament team, along with teammates Josh Ruehlen and Austin Martin. For a complete rundown of the 2011 Cannon County Elementary Tournament championship and consolation games, along with the All-Tournament teams, see the Feb. 8 edition of The Cannon Courier. WAY TO GO BLUE!!!!! Community spirit is alive and well don't change a THING. Congrats to the Auburn girls and boys. You have made this town proud..
Congrats to the Knights, Lady Knights, and the cheerleaders !!!! Way to make Auburntown proud !!! Best way to end the season. Congrats to both girls and boys. YEHHHHHH! We are so proud of our kids. These are a wonderful group of kids led by a wonderful leaders. We are blessed to have such great faculty and principal at Auburn School!